6:30am we were all up. 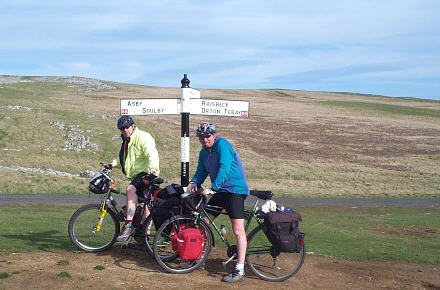 Karen (Graeme's wife)went to work and we busied about getting our bikes ready and loaded with our gear for the week. We have now visited all 3 houses on our rides over the last 10years. It was a fine sunny day, Graeme made Bacon butties then after breakfast on a cool but sunny morning we set off on another epic. 8: 20am we were on our way. It was at this point Colin thought it would probably be a pretty uneventful ride. How wrong he was! With a downhill start cycling down Vicarage Drive is a novelty in its self. We usually have to cycle up after a days ride when I visit Graeme. We had literally just started turning the wheel when my phone received a text message, it was Jill, Graeme thought it was hilarious and immediately imposed a ban on all mobile phones, during the day ride. Didn’t work did it? 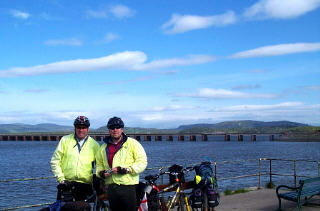 We cycled down to Arnside following Sustrans Route 6. 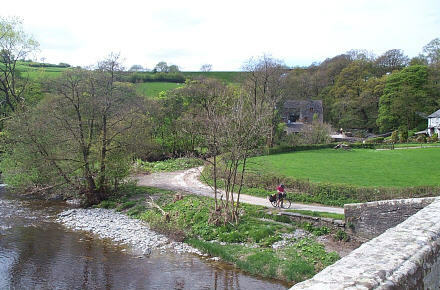 Kendal to Arnside is a favourite ride of ours and it was funny doing it today withy full panniers at it usually a day ride out. Everything was going well a fairly uneventful ride to Arnside, we encountered roadworks as we cycled into the village, I just knew the road would be up. I had to stop and look at the Flats at Sandside, another one was for sale. I have been toying with the idea of buying one. They over look the Lakeland fells and across the estuary. On a fine clear morning the views are breathtaking. But my circumstances have changed in recent months so buying here is now not an option. We will leave it for a possibility in the future, you never know how things can turn out. We got into Arnside having to push though the blocked road along the footpath, made it to the promenade, it was very quiet as we took the obligatory photograph. I purchased a postcard and managed to fall on my backside sorting my bike. Colin suggested I buy a card saying "on my backside in Arnside". Colin climbed down to the beach collected three pebbles and climbed back up the hard way. We had decided to carry these from Morecambe bay to the North Sea. So at approx 9:45am we were ready to pedal towards Berwick well Appleby today, another adventure was about to start. One god thing we had the wind at our backs for a change and the sun was shining. We cycled through the quiet lanes around Crooklands , where my phone fell from my pocket onto the road. Could have been the biggest disaster of the ride, I tried to retrieve it without the other's knowing but no they turned back to see what was up, more leg pulling, and it was still working. Killington and the hills were starting and guess what, I started having problems with my bike, typical, the gears were not engaging properly, as soon as any pressure was put on them by peddling uphill the chain would slip round on the cogs with a great clattering and distinct lack of forward movement. OH hell Tony in the bike shop had noted the gears were worn but we thought they would be ok for this ride. Colin had a look but said only solution was new gears and chain, as all the teeth were badly worn. Well we do a lot of miles. 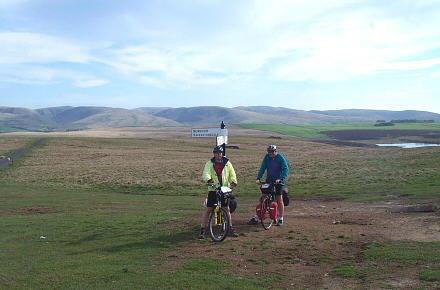 We cycled on and plugged into Cycle route 68 the Pennine Way. Graeme informed us we were also on a stretch of the new Coast to Coast Walney to Wearside which is to open shortly. On the back road from Farside towards Tebay my bike was getting worse. It was scratch your head time and as we cycled along and climbed even more rises with the clattering and slipping gears, we mulled over the options, as it was clear the bike would not make it to Berwick. We were only 6 miles from Kendal as the crow flies. We stopped and had lunch, ate Karen’s enormous picnic. It was warm and sunny. All the options were thought through. Graeme rang his mate Craig Booth, fortunately he was at home and was asked if he would bring out Graeme’s spare bike from his garage, no problem, Craig was happy to do this and as we were around 10 miles from Tebay we said we would meet him at Tebay Junction. We then had a run along the military road to Tebay. As we rode there was a signpost knocked down which said Appleby 25 miles on it (and it was 25 miles) I had been thinking it was only around 16 miles. I accused Graeme of taking down the sign to hide the mileage, the things you think about when you are knackered. We cycled towards Tebay as we joined the main road we saw Craig’s Vectra coming towards us he’d seen us and came down the road to help. We stopped at the junction with Roundthwaite just off the Motorway and it was bike swap time. Colin cobbled together the wheels from my bike well the front wheel with Graeme’s old bike and swapped tyres and tubes. We patched everything up and then after a lot of Mickey taking we were on our way, again following the Pennine Route 68. Mmmmmmmm which takes you away fromTebay and up and around Roundthwaite what a hell of a climb especially with me struggling with only 3 gears and a strange bike. it would change from big ring to small ring but not any intermediate gears fortunately it was stuck in lower spool so I could actually cycle but everything was different and I am afraid I threw the Teddy out of the cot, first time in 10 years of cycling, it got to me. What with the fact we were climbing high and I knew it was flat through Tebay and I could see Tebay in the bottom. I was annoyed my bike had given up the ghost. So I got a verbal kick up the backside from Graeme it wouldn’t be the last this ride. Anyway I should have more faith for as we passed over the motorway we had a short rise to climb and then we rolled down into Orton village. Toilet and drink stop draw breath rest and reflect. Eleven miles to cycle via Sun biggin tarn, wild wild country. We edged closer and closer to Appleby it had been a long day, even Colin was struggling, but crouching over my bike for a while hadn't helped his leg muscles. Fortunately we dropped through undulating countryside and rolled up, yes up always a small rise to encounter after 61 miles. Or the sting in the tail as we call it, and arrived at the digs. Bongate House, our second ever longest day but we were at the digs for 6pm, not bad considering the problems. Bongate House was also to be our saviour! We were pretty whacked as we were shown our rooms. Collapsed for an hour and caught up on phone calls, which made me feel better? Around 7:30 pm we strolled down into downtown Appleby, well actually first left over the bridge and into the first pub. No worries about watching what you eat after pedalling 61 adventurous miles through the hills of South Cumbria. It was a Jennings pub bit rough and ready but the food and the beer were spot on. It was Darts Final night so the pub emptied as they were all going to shout the Local team on. It was funny in the pub we sat ate dinner couple of pints and we were all nodding. I was mulling over cycling to Berwick on 3 gears what had to be done had to done Graeme ever the optimist. Was that it? Or was their to be a plan B by the Cop. We were all too tired to wait around. Not a lot of rocking I fell asleep as I hit the sack. An adventurous, first day that is just the start.